I’m leaner in my forties than I was in my twenties because of these simple lessons. Here’s the deal: Being smarter with my diet was a learning process for me. As a kid and throughout my entire basketball career I thought eating healthy meant having pretzels with no salt on them. But when you’re young and constantly burning calories from participating in a sport as I was, you didn’t have to be as considerate about the nutritional choices you’re making. But all that changed once I stopped playing professionally and got older. Being older and retired from pro sports naturally slowed my metabolism down, so I could no longer get away with what I was eating back then. Today I’m leaner in my forties than I was in my twenties, and it’s not because I’m more active; it’s because I realized how the mind, body and spirit all work with one another and how eating to please all three was the key. Over the last two years something that’s been a big game-changer for me has been trusting my body a bit more. You’ve seen them — those lists of healthy foods that are wonderful because they have the right nutritional mix. But the thing is, don’t believe every “good-for-you” food is always the best choice for your body. Take eggs, for example. Nothing offers more nutritional value in terms of protein than an egg, and when I was in my twenties, I used to eat two hard-boiled eggs fifteen minutes before I exercised. But for some reason I’m not able to digest whole eggs like I used to. If I have them, I suddenly feel full and lousy for hours. But when I was first starting to experience that reaction, I never equated it to eating eggs and blamed it on other foods. After all — eggs were on the “good” list. Data shows that different people have vastly different responses to the same food — we don’t all metabolize food in the same way. Here’s the thing: we all process food differently. 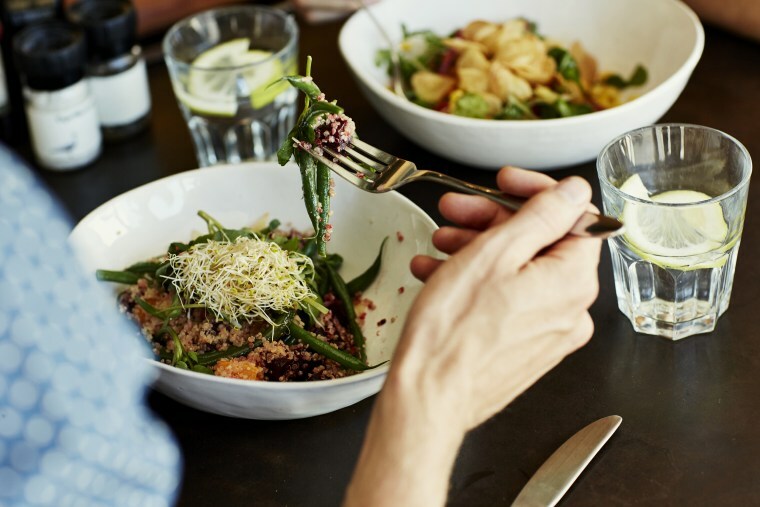 One study performed by the Weizmann Institute of Science in Israel tracked the blood-sugar levels of eight hundred people to see how their bodies responded to eating the same foods over a week’s time. A total of roughly forty-seven thousand meals were measured — and guess what? The data showed that different people had vastly different responses to the same food, so we don’t all metabolize food — even if it’s incredibly healthy for us — in the same way. That’s why it’s important to pay attention to how your body reacts to every type of food. When you dial into your body like this, you do yourself a service because you won’t just be blindly following the rules on what you should and shouldn’t eat. Why settle for snack food when it’s snack time? That’s where a lot of people get themselves in trouble. They’ll eat healthy when it’s mealtime, but snacks somehow become a free-for-all. Even hearing the word snack may sometimes be the reason you’re reaching for things that are less nutritious in the first place. Maybe it’s because we’ve been led to believe that anything we eat in between meals needs to be some sort of grab-and-go option or something with less flair like an apple with a little peanut butter on it, when that’s not the case at all. You don’t have to back yourself into a snack corner; instead, you can continue to eat the same types of meals you’re having for breakfast, lunch or dinner — only make them smaller. A lot of times I’ll just wrap up what’s left of my lunch and have that final quarter around three o’clock. Or I might have a small container of beets and diced chicken. My point being, if you find yourself reaching for the wrong foods in between meals, try making a little extra of the good foods you’re having during mealtime so you have a few convenient smaller-sized portions around to eat instead. Often after a spin class I’ll be craving a coconut water or find myself wanting to reach for watermelon juice. But if I drink water first, then I’ll usually notice that my desire for what I originally wanted to drink goes away. I’ll actually say to myself, “You know what? I’m good now!” That’s why I always put water front and center before any other craving I might have when I want something to drink. People who increased their water consumption by just one percent reduced their total daily calorie intake, along with their daily intake of sugar, sodium, saturated fat and cholesterol. Need another reason or two? When researchers at the University of Illinois at Urbana-Champaign examined the nutritional habits of more than eighteen thousand adults, they found that the majority of subjects who increased their consumption of water by just 1 percent — 1 percent! — reduced their total daily calorie intake along with their daily intake of sugar, sodium, saturated fat and cholesterol. In addition, those who drank an extra one to three cups of water daily ate between 68 to 205 fewer calories and 78 to 235 mg less sodium a day. I get that water can be boring, although there are ways to make it better, like putting fruit in your water (such as cucumbers or berries) and letting it sit to change the taste a little bit. But reaching for juice or anything with calories and/or sugar when you’re really thirsty can be a big pitfall for many people. Instead, try having at least one full glass of water first to see if that sends the craving away. RELATED: I Followed the Federal Dietary and Exercise Guidelines for a Year. This is What Happened. Along the way don’t be surprised when you start noticing that you’re sleeping more soundly, have a nicer smile, feel more alert or notice your mood improving. A recent study published in the British Journal of Health Psychology found that just by eating fruits and vegetables, you will feel happier, more creative and more curious. One thing you may notice right away is a change in your skin, particularly when it comes to bloating. When you eat poorly for a long time, you get used to being bloated, and I think there’s nothing worse in the world than feeling bloated. But when I eat right my skin becomes naturally tighter, and if you don’t know that you’re missing out on that, you don’t know how good that feels not to be that way. It’s these perks along the path that sometimes go unnoticed, but they are your little cheerleaders. These are the things you may not necessarily think about, but when you recognize them, you realize there are these little bonuses along the way. When you can dial into these little things, they cheer you along and keep you going when the big picture gets a little daunting. In basketball it’s often the last few minutes of the game when the game is either won or lost. That same truism applies to your diet. When it comes to healthy eating, a lot of people can maintain their diet from morning until just around those last three hours before they head to bed. But once they reach that three-hour zone, that’s when everything falls apart. For most people, it's that three-hour zone before bedtime when everything falls apart. It’s that uncontrollable evening eating that most people have a hard time with — and I’m no different. That’s when it’s so easy to take an entirely good day and throw it all away — when twelve hours of willpower gets destroyed by three hours of weakness. Teeth: Something I’ve done over the years that works for me is instead of brushing my teeth at bedtime, I brush them once I’m done eating for the night. Using this trick usually keeps me from wanting to eat again because, on those rare occasions when I have, it makes me feel lousy knowing I’ll have to brush them all over again. Tea: A lot of times the reason we snack at night is that we’re winding down from the rest of our day and just looking for something to do. So all your late-night eating may be just the act of needing to do something. That’s why I found just the whole ritual of making and drinking tea (something caffeine-free — I prefer chamomile) to be a great way to satiate that need without eating anything my body shouldn’t be having unnecessarily as a result. Talk: Believe it or not, whether I’m by myself or other people are over, I’ll actually say out loud that “the kitchen is closed!” Yep, I’ll make an official proclamation that the room containing all my food is now off-limits. I’ll admit that sometimes this doesn’t work as well as the other two do, but when you make yourself accountable — even if it’s just to yourself — it can leave you feeling like you’re going back on your word, which I’ve found makes me less likely to do it. Excerpted from Lifted: 28 Days to Strengthen Your Body, Focus Your Mind, and Elevate Your Spirit by Holly Rilinger. Copyright © 2017. Available from Da Capo Lifelong Books, an imprint of Perseus Books, LLC, a subsidiary of Hachette Book Group, Inc.